Replacement Ace Banner Frame Hardware. No graphic. 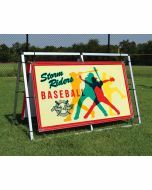 All replacement frames include a 4ft or 8ft Ace Banner Frame, bungee cords to secure the banner to the frame, ground stakes to secure the frame into the ground, and a canvas carry bag.